There lived one working couple Mira and Sushant, who found many sparks to make their relationship strong and stronger. They were among those typical busy working couples and hardly found time to spend with each other. Hence they frequently used to plan to meet outside as lovers and enjoy. One day they decided to go to nice restaurant and meet each other. So both went separately in their vehicles and reached the restaurant. Table was already booked. Both went to their seats and just greeted each other, as if they were not married. It was a greeting as usually done by a love birds. Mira - how I am looking today? Mira- you mean more beautiful than the girl who is just sitting behind you. Mira- that means you was observing that girl. Sushant- why? Is everything ok in your job? Sushant- Remember, I am your boyfriend and also your best friend. You can share anything with me. Mira- ok listen. I told you about our new senior HR whose table was just opposite to my table. Sushant- Yes, what happened to him? Mira- Nothing happened. He stopped looking at me. Sushant- for this reason your day was bad. Mira- Ya, all these days he used to observe me and suddenly he has stopped looking. Sushant- Are you serious? But you never told me about this before. Mira- yes. I never told you because he was looking at me. And when I realized that he stopped looking at me. I felt like to tell you. Sushant- how was he looking? Mira - he was one of the good looking guy in our office. Sushant looked nervous and could not understand that it was a prank she played on him. She then took Sushant hands in her hands and asked her to look at him. Sushant was also a smart actor and he was waiting for this moment to arrive. But he could not control his laughter. Mira to fell in trap. Suddenly both started laughing and making fun of each other. Here you have a great video to #BringBackTheTouch By Parachute Advansed Body Lotion to sparkle your silent relationship. Coming from the house of Parachute. 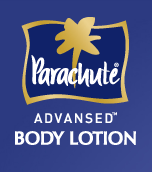 With its unique formulation of 100% natural moisturizers.Parachute has come up with new body lotion known to be as Parachute Advansed body lotion. Parachute Advansed body lotion, enriched with the goodness of coconut milk which nourishes from deep within the skin and gives you transformed nourished skin in promised 7 days. This post is the part of #BringBackTheTouch by Indiblogger.